Marianta presents a sparkling program drawn from the rich traditions of the Netherlands. With a touch of humor and a whiff of theatre the performance takes you right through the seasons, from New Year's Day through to the next New Year's Eve, stopping at all the feasts and festivals on the way. Amusing anecdotes, background information, songs, tunes and dances breathe new life into bygone days when the seasons dominated life and the people lived from feast to feast. 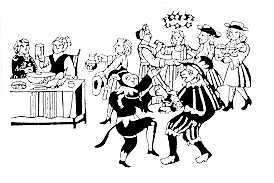 The songs and dance tunes are performed to the accompaniment of accordeon and recorders, plus some more unusual instruments such as the shawm, crumhorn, hurdy gurdy, bagpipes, hommel (Dutch dulcimer), rumbling pot, klepperklomp (clatter clog) and a tea chest bass called 'Kees'. The audience joins in the show in many surprising ways! Marianta can perform this program in Dutch, English and German. Prick up your ears: Old Dutch songs and dances performed with unusual musical instruments (shawm, hurdy-gurdy, crumhorn, hommel (Dutch dulcimer), bagpipes, and rumbling pot. Sing-along: Chorus songs, work-songs (shanties) and tear-jerkers easy for the audience to learn. Dance-along: Easy to learn dances for everyone as well as dances for the more experienced. Beautiful costumes from the Dutch Golden Age can lend a special dimension to these programs. 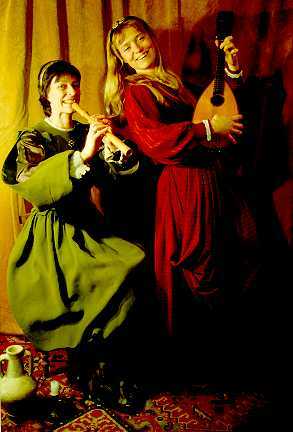 Marita and Marian studied musicology at the University of Amsterdam and have been working with traditional music and dance of the Netherlands since 1976. They have produced a number of CDs, some of them with descriptions of the dance steps. They can regularly be found performing at international festivals all over the world. December 2005 their book 'Nederlandse Jaarfeesten en hun Liederen' was released, about history, traditions and the songs of the Dutch annual festivities. The duo Marianta, sometimes joined by other musicians, present a variety of programs and workshops. As well as playing their "Jaarfeesten" shows, they also appear as troubadours at medieval festivities and combine with Rutger Dijkstra and Ad Bos to form the group Kapriol"! As 'Dames Dubbel' they did various theatrical and humorous music-programs. Kapriol'! : concert program in Dutch, Frisian and/or Esperanto, balfolk with European balfolkdances, maritime program, medieval music for historical events. Four musicians. Hear, See and Taste: special program with songs, stories, snacks, dances and slides from Dutch History. Two musicians, one storyteller. Workshops: orchestration and playing of dance music, song and dance workshops. There are several recordings on CD available. For performances see gig-list. Who are Marita and Marian?